Forays of a Finance Foodie: The Angus Club Steakhouse: A Prime Choice For Great Aged, Grass-fed Beef! 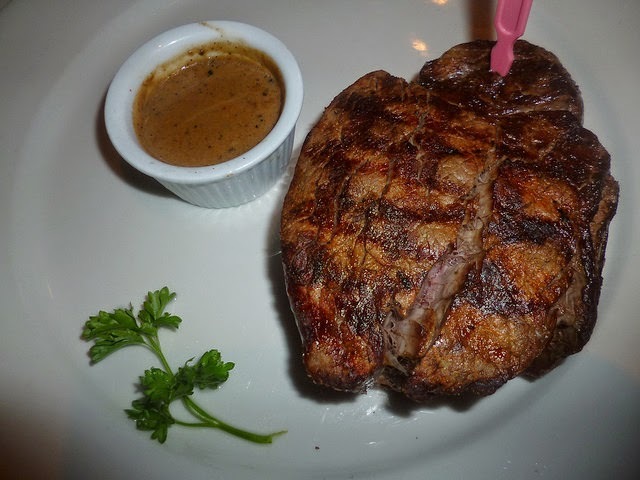 The Angus Club Steakhouse: A Prime Choice For Great Aged, Grass-fed Beef! 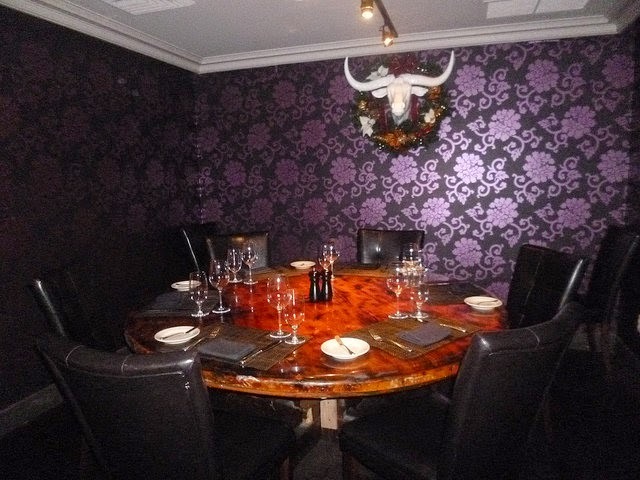 To be straight and to the point, I adored my recent (and first time) visit to the Angus Club Steakhouse. Their supplier of meat is Master Purveyors (masterpurveyors.com), whom also supply such other wonderful New York steakhouses including Bobby Van's Grill, which I declared a year ago to have the best and biggest filet mignon in NYC. Well, when I bit into my filet at Angus Club Steakhouse, the aged, grass-fed meat (done medium rare) was so delicious and "buttery," that I swear I died and went to some sort of beef heaven! But I am getting ahead of myself. My dining partner and I started out with Mozzarella & Beefsteak Tomatoes ($15), one of the few non-seafood appetizers ‎on the menu. (I guess that the Angus Club Steakhouse folks know their clientele well enough to realize many of the customers like a seafood app if they are having a meat entree.) The fresh mozzarella was served in large two-ounce slices and the organic beefsteak tomatoes were deep red and juicy. This “Caprese” was lightly drizzled with wonderful green EVOO. You can never go wrong with fresh mozzarella fresh basil pieces and juicy tomatoes; it's a no brainer. We then both ordered the Filet Mignon ($49 for a 12 to 14 ounce portion). The flame-grilled meat had a beautiful light crust and pretty grill marks on the outside--quite enough to make us drool. We did not even need steak knives to cut the meat and it came seasoned with premium pink Himalaya sea salt! This was filet at its most flavorful; you could not ask for a better cut in New York or anywhere else for that matter. We shared three generously portioned classic steakhouse sides: Peas And Onions ($10), Truffle Mac And Cheese ($12) and Steak Fries ($9). The peas had large slices of sautéed onions and we're obviously cooked in truffle oil; the peas were cooked medium firm, just how I like them. 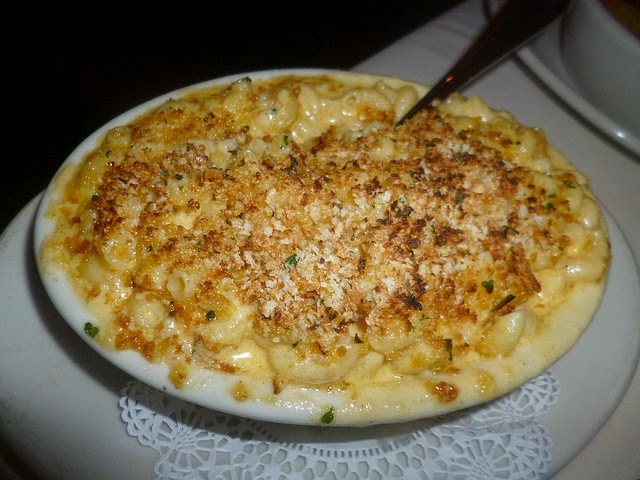 ‎ The Truffle Mac And Cheese featured melted organic Wisconsin Cheddar and had delicious organic salted butter and cream mixed in with the truffle oil. They intentionally do not make the cheese sauce overly rich like some steakhouses do, and the cheddar has a mellow edge rather than a sharp "kick." The golden Steak Fries are offered in a truffled version but we took our fries done the regular way (with vegetable oil). The organic Idahos were cut into medium-sized plain sticks and were perfectly seasoned with sea salt, pepper and some mellow mystery spices. They were crispy when we bit into them and the extras were well worth taking home in a doggie bag! We sampled two desserts while taking in the romantic nightly live piano music and the "modern hunting lodge” décor: Apple Strudel ($12) a la mode (simple homemade vanilla ice cream was used) and "schlag." I got a kick out of the way they used the German word "schlag" instead of "whipped cream." I guess that gives the aura of being a "manly man" steakhouse, LOL! Seriously though, while there were many tables full of just males, a third of the place was full of couples on romantic Friday night dates and another large percent were co-workers grabbing a hearty bite after a long Friday. But back to the desserts…the Strudel pastry was golden and flaky, while the apples were cinnamon and juicy. It was truly done in the traditional German style. 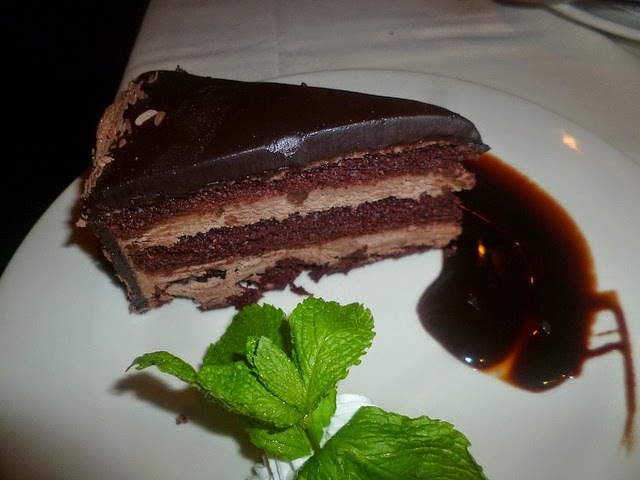 The Chocolate Mousse Cake featured moist devil’s food laye and a mousse that was not overly sweet. I would like to go back and try the Ribeye. I have heard wonderful things and read glowing Yelp! reviews about nearly everything served at Angus Club Steakhouse. I plan to also try the raved about tiramisu, which is actually the only dessert made on the premises. (Don’t let that bother you—the desserts my dining partner and I had were total knockouts and tasted super-fresh!) The service at Angus Club Steakhouse is super-attentive without being intrusive, and I give them extra points for that. The restaurant is extra-large with high ceilings, so you are seated quite far away from others while so many NYC steakhouses are tightly packed. It’s nice to be able to “breathe” while you dine!